Most of the material for this issue was gathered together by Cheryl Prax who campaigns against electroconvulsive therapy (ECT). Included are pieces which discuss the bio-electrical realities, the so-said efficacy, the harmful ‘side effects’, and the social and judicial aspects of this controversial psychiatric treatment; mixed in are a number of accounts of what it is like to be subjected to shock treatment. The reader can judge whether ECT should be permitted – as a useful ‘last resort’ – or opposed – as always a barbaric and harmful means of psychiatric coercion. But first we must announce the death of a founder of this magazine: Alec Jenner. 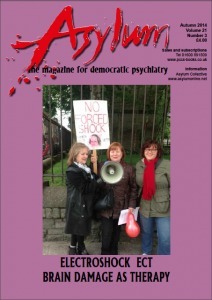 To read the latest issue of Asylum Magazine, SUBSCRIBE HERE.